The Potters are back on European soil for the first time since 1974! (Ignoring the Anglo-Italian Cup years - proper Europe). Thursday night football at the Brit, away-days that involve flying and Channel 5 for the rest of us! "All supporters of any team competing in any UEFA competition shall have a section known as "The Ultras." 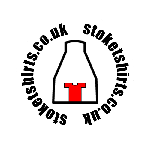 In a bid to comply with the said rule then we have introduced the Stoke Ultras range. Stoke Ultras - All Over Europa. This product was added to our catalog on Monday 11 July, 2011.